We're nationally certified by the National Association of Mold Professionals (NAMP) for testing and remediation. Having trouble getting rid of mold? 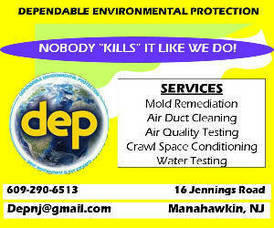 Dependable Environmental Protection can help. Rely on us for mold testing. Count on our years of experience to keep your home mold-free! If you reside in Manahawkin, NJ, call us now! Breathe fresh, clean air again with a thorough cleanup of your air ducts. We'll clean your home and office air ducts too!